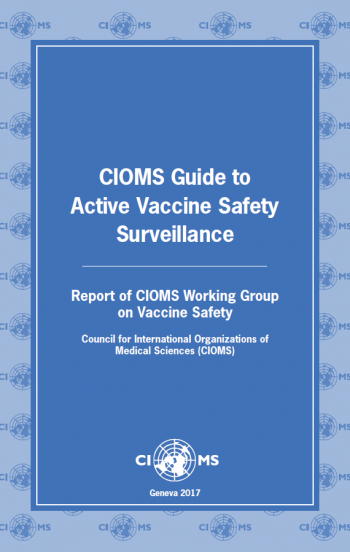 The CIOMS Guide to Active Vaccine Safety Surveillance was published in 2017. The second vaccine book, the CIOMS Guide to Vaccine Safety Communication, was published in 2018. Employees of governmental institutions including regulatory bodies, as well as non-profit organizations, can obtain a free PDF of the CIOMS Guide to vaccine safety communication. Please email info@cioms.ch to obtain your free PDF. 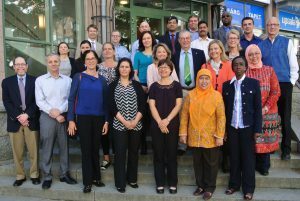 The CIOMS Working Group on Vaccine Safety (WG) was established in 2013 in order to provide a forum for information exchange and interaction between public health agencies, regulatory authorities, industry and other stakeholders of the World Health Organization’s Global Vaccine Safety Initiative (GVSI), as well as to establish a “think-tank” to develop and propose new concepts to GVSI and other global harmonization efforts in the field. To promote a more efficient and rapid collection and exchange of information between national regulatory agencies, multilateral agencies and vaccine manufacturers. To develop guidance documents on the use of harmonized tools and methods for vaccine safety monitoring activities between national regulatory agencies, multilateral agencies and vaccine manufacturers. To propose mechanisms for vaccine safety monitoring in difficult settings, i.e. those with minimal infrastructure. The formation of the WG is linked to the WHO’s Global Vaccine Safety Blueprint and its implementation plan, the GVSI, which aims to assist the activities of low- and middle-income countries (LMICs) in their work with vaccine safety surveillance. The working group consisted of 40 members and alternates from a range of stakeholders interested in vaccine safety throughout the public and private sectors, including members representing organizations in resource-limited settings. The WG held its first meeting in London in May 2013 and had subsequent face-to-face meetings in Geneva, Atlanta (Georgia USA), Uppsala (Sweden), Rabat (Morocco), and Lyon (France) and numerous teleconferences when needed in between times. Cross-sectorial teams formed around the main topics to identify resources already available, to avoid duplication of efforts, to plan the critical areas for the WG’s collaboration and to produce consensus documentation in a context which will be useful particularly for responsible parties in resource-limited countries involved in vaccine safety. Following the WG’s eighth meeting, held in Accra (Ghana) in March 2016, the CIOMS Guide to Active Vaccine Safety Surveillance was published at the beginning of 2017. A subsequent CIOMS Guide to Vaccine Safety Communication was published in early 2018.